There are still some spots available on the Alaska Cruise I’ll be taking with Reid Tracy as we offer our Speak, Write, Promote workshop at sea. You can learn all about the program and cruise here. If you missed our informational call on the Alaska cruise, you can listen to it here. This morning I went outside onto our back deck to sit in the sunshine. After the long, harsh winter, my body is almost ready to trust that spring is actually here. As I looked around at all the cleaning up I needed to do to get ready for new plants, I started imagining how difficult it was going to be to move big pots, lug bags of soil, replace containers that were damaged by the wind and snow. That’s when I remembered a blog I wrote in 2012 about preconceived expectations. I went back in time to reread my words and decided to share them with you today. It’s a story worth remembering when we work ourselves into an unnecessary, emotional frenzy . This week I had an opportunity to visit the Registry of Motor Vehicles (RMV) – the office here in the US where you get your driver’s license renewed every five years. Before you read on, though, stop for a moment and notice the thoughts that occur to you when you think about visiting the RMV (or some kind of ‘official office’). My license expired last November on my birthday and I’d been remiss in getting it renewed. Well, Wednesday night, on my way home from dinner with my husband, Michael, I was stopped by a police officer for driving with an expired license. He was kind enough to let me go without a ticket and strongly suggested I get it renewed ASAP. The next day I stepped out my front door headed for the RMV, dreading the visit. I imagined myself waiting in long lines, dealing with grumpy, overworked and underpaid employees, and spending half my day on what should be a five minute task. I even worried about whether or not I’d pass the eye exam. And my eyes are perfectly fine . In that moment of awareness I made a decision to break the spell. I started imagining an easy, fun experience. In my mind I saw happy people waiting in line, friendly employees ready to help, and I affirmed that it would only take a few minutes to get my license renewed. I drove to the address, parked my car, and went inside. When I walked into the RMV office, I saw at least twenty people waiting in line. I took a number and sat down next to a sweet elderly couple, to patiently wait my turn. I closed my eyes and visualized an easy and comfortable experience. Within ten minutes I was called to the license renewal desk (the quickest moving line). The gal who renewed my license was not only pleasant and helpful, she was jolly. And my transaction was finished in less than ten minutes. As I left the desk of the gal who helped me, I remembered a stack of Self-Care cards I keep in my purse. I pulled out the cards, fanned them in front of her, and invited her to pick a message for the day. Surprised by my offering, she chose the “Passion” card, “Resurrect a childhood dream.” She laughed and thanked me for the gift. I left her desk with a whole new attitude toward the RMV. 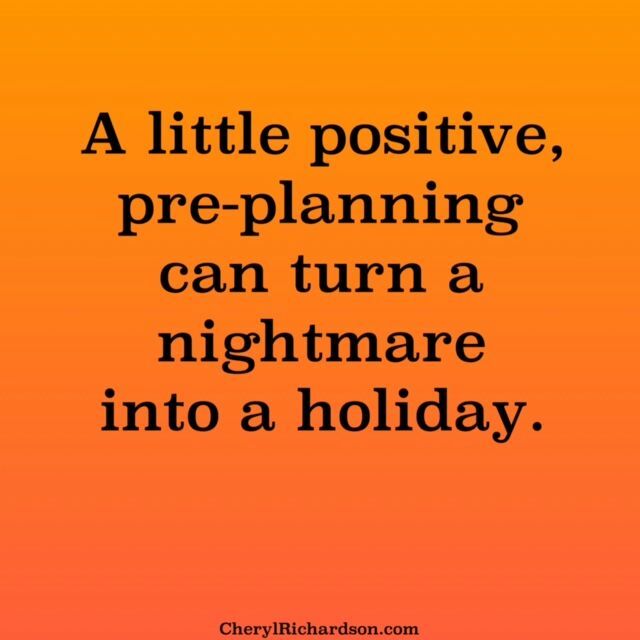 A little “positive pre-planning” can do wonders for any type of event. Instead of getting started on the deck garden right away, I’m doing something else first. I’m visualizing five strong men smiling at attention, waiting for me to give them directions from my lounge chair in the sun. I’ll let you know how it goes . This week’s video shows fifty seconds of pure love and cuteness. You can watch it here. Thanks, Mr. Bob!